“Vacant Lots to Greenways” is finding and connecting vacant lots to create a greenway along the Blue River thus providing an accessible amenity to the community and to showcase green infrastructure to address stormwater pollution. Where was the greenway proposed? Who owns those—are they publicly owned? HCA and 15 grant partners are working together to create screening tools that can be replicated and scaled up for use across the metro area. The analysis is the first phase of the two‐year project. The second phase begins in the summer of 2015 and involves both active community engagement and on‐the‐ground site visits to fine tune the process of identifying vacant lots that should be re‐used and preserved as open space for the health of the watershed and community. The final stage of the project will be working with the neighborhoods and the city to determine what and how vacant lots might best be connected to the existing greenway and what recreation elements, such as playgrounds and picnic tables, should be created for the neighborhoods. They will choose three sites and engage neighbors to repurpose the lots and create greenways. For HCA, the filter is stormwater and biodiversity; the community filter is revitalizing their neighborhood. HCA and its partners want to show people and leaders how valuable greenways and green infrastructure are to a city’s long‐term health and sustainability. They are demonstrating an important process that values equity and inclusion to empower people, create multiple benefits and elevate the need to protect our natural resources. Next Step: Community Engagement and Vacant Lot Transformation! ⇒ A project needs a visual and place‐based focus: People need to grasp an idea with a vision. HCA and its partners focused on the Middle Blue River and a greenway corridor—an easy to understand idea. ⇒ A project may already be planned! A “vision plan” may already exist that has great community input, or a Natural Resources Inventory may hold secret gems of opportunity. Just go do it! ⇒ A project takes time and it creates community and strong partnerships. The process of restoring or recreating natural areas takes time and because it does, the process itself builds the community. ⇒ Align your strategy to that of your partner—this creates many audiences and supporters. ⇒ Find that initial grant to launch your efforts. For HCA, the EPA Urban Waters grant was instrumental in getting the project started and allowing HCA to build such a supporting community partnership. ⇒ Actively engage the community early on so they have their say and keep them involved with meaning‐ful events along the way. Oh yes, and did we say Build Partnerships? Heartland Conservation Alliance is a grassroots non‐profit, launched in 2012 to restore and protect natural areas in the Kansas City metro area. 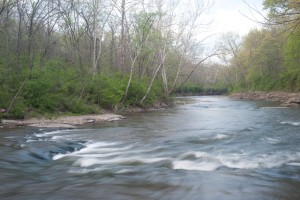 They are currently focusing efforts in the Blue River watershed, home to one of the region’s largest and most urban rivers. As an urban land trust, they work to re‐generate what’s been damaged, taking existing plans “off the shelf,” and work across all boundaries to save valuable resources in the community—natural, historic and cultural. Their mission is to provide multiple benefits to their community through their planning and action. Key strategies are to Convene partners, Conserve and restore land, and to Connect people to nature or to connect them for the first time. Roberta Vogel‐Leutung. EPA Region 7.